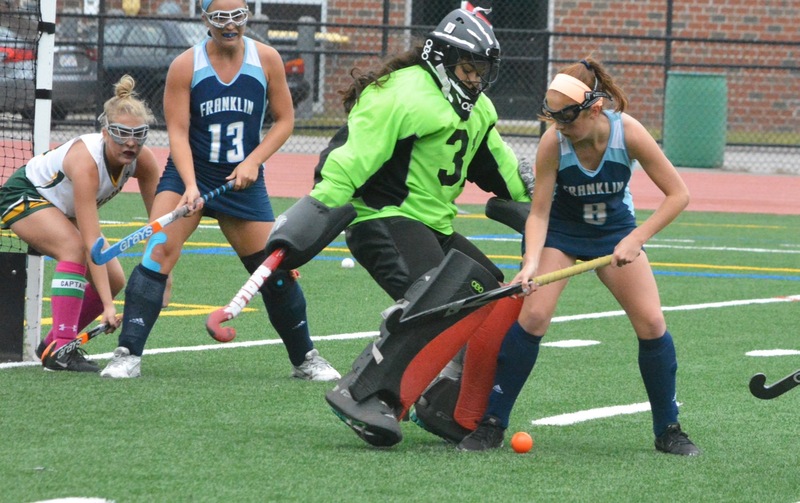 Franklin, 1 vs. Chelmsford, 1 – Final – Senior Jill Sirignano scored off of a rebound for the Panthers. Senior goalie Samantha Jones had seven saves to help preserve the tie. Franklin head coach Lisa Cropper said senior Kenzi Pleshaw and sophomore Christina Quinn both also had strong games for the Panthers. WRENTHAM, Mass. – For the first time, Franklin and King Philip field hockey met up on the brand-new turf at Macktaz Field in a meeting between the first and third place teams in the Kelley-Rex Division. The Panthers came in unbeaten in the league, but the Warriors came in fired up at the chance to knock their rivals off the top of the league standings. With just a little more than a minute remaining in the game, and after nearly 20 minutes of nonstop Franklin pressure, the Warriors finally got a break and a scoring opportunity. Senior attacker Casie Curtin hit the edge of the circle and fired towards goal, but Franklin senior goalie Sam Jones, who had spent 20 minutes standing in the cold wind as mostly a spectator, was out to cut down the angle and kick the shot aside. The Panthers (7-1-0, 7-0-0) got a goal from Christina Quinn nine minutes into the game and held on for a 1-0 win that could have been larger but for a steadfast KP defense and 14 saves (11 in the second half alone) by KP goalie Abby Campbell. KP was fired up for to defend its home turf and the first half was even with chances on both ends. With 21:02 left in the half, Franklin took the lead off a penalty corner. A scramble in front was knocked home by Quinn to make it 1-0 and take some of the wind out of the Warriors sails. Two minutes after taking the lead, Campbell stopped a breakaway by freshman Annie Walsh to keep the Warriors within one. Midway through the half, Alex Sullivan was yellow carded giving KP a player-advantage for five minutes, but the Franklin defense cleared it without the Warriors getting a shot on goal. KP’s best chances came either side of halftime. The Warriors had two penalty corners in the closing minutes of the first half but the Panthers managed to get the ball clear both times. In the first five minutes after the break, KP also pushed the Panthers back on their heels but again Franklin and Jones kept the ball out of the net. From the 20-minute point until the final minutes of the game, the field seemed tilted towards Campbell. Franklin continually pressured the KP defense and prevented the Warriors from getting the ball forward into the attack. Courtney Foley and Christina Hathaway kept looking for the big hit to spring a KP break but Franklin’s Dana Lewandowski, Kenzi Pleshaw, and Jill Sirignano seemed to always be in the way. The Panthers turned the interceptions into offensive chances. Franklin forced 10 penalty corners in the second half alone and forced Campbell into 11 second half saves. Despite the numerous chances, Franklin could not add to the lead and it allowed KP to make it a nervous final few minutes. Jones made the save and prevented KP from snagging an unlikely equalizer. Franklin travels to Milford on Monday evening, while King Philip (5-3-1, 4-3-1) will travel to Stoughton.